Authored by CJE members Doug Cowan and Jon Foxx, this is the definitive handbook for DUI defense attorneys practicing in Washington. 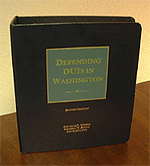 DUIs in Washington, Third Edition offers step-by-step instructions for every detail of the law that applies to a drunk driving case-from the moment the police officer initiates the stop, through trial and appeal. This leading Washington reference allows practitioners to have “at their fingertips” the case citations, court rules, and statutes to plan the defense, prepare pretrial motions, support or overcome objections, and obtain favorable evidentiary rulings. The discussion is packed with winning strategies and tactics to maximize the chance of a successful defense. Available from the LexisNexis Store. Click here to learn more.